It was absolutely beautiful yesterday at a surprising 18 degrees outside! So naturally I had to take a little photoshoot outside my apartment building. It's our last month at this place and then we are moving! Which is pretty exciting since I will have much more room and more freedom to decorate to my tastes. I found this amazing vintage necklace on the weekend while perusing the aisles of Value Village. My sister frequents that store in search of jewelry and clothes that she can give a new life to and she has always told me to go with patience and search. Well I went in with tons of patience and found this gem! I absolutely love it.. it is a tad heavy though (I can live with that though since it was only $8). In other news..it is almost the weekend! I am so excited since it's Easter! Lots of yummy food and desserts of course. 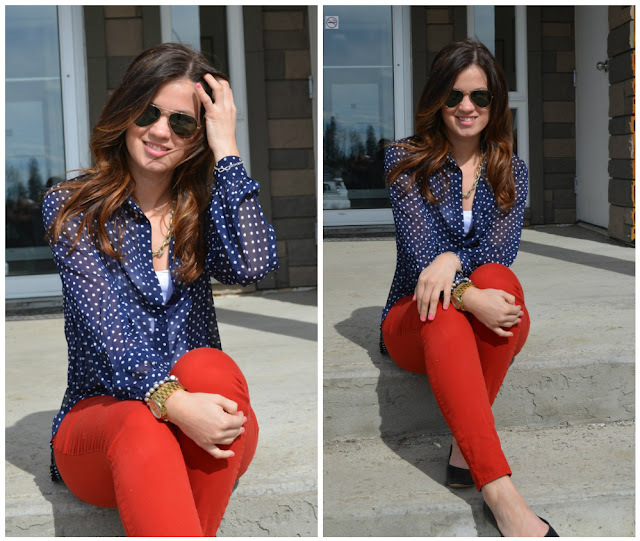 Love the polka dot blouse with the red pants! Also, can't believe you found that necklace at Value Village! It looks so great with the outfit! Great outfit. I've been wanting some red denim but haven't found the perfect pair yet. Those look great on you! you look adorable! I love everything about this outfit!